Conglomerate has paid dividend every quarter since 1994. Industrial conglomerate NACCO Industries (NYSE:NC) announced yesterday its second-quarter dividend of $0.25 per share, the same rate it paid in February, which reflected the spinoff of Hyster-Yale Materials Handling last September. Previously the rate was $0.54 per share, though it paid a special dividend of $3.75 per share to investors in December. The board of directors said the quarterly dividend is payable on June 14 to the holders of record at the close of business on May 31. 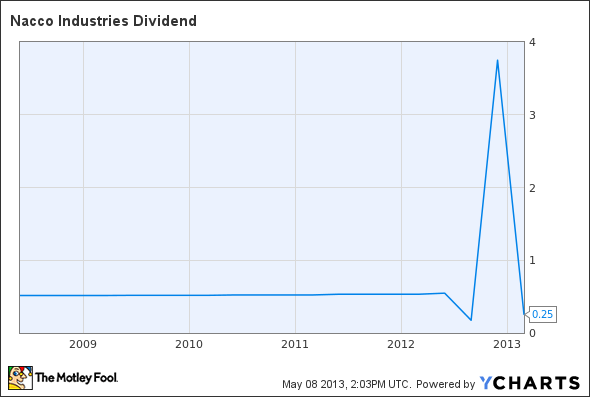 NACCO has paid a dividend every quarter since 1994. The regular dividend payment equates to a $1.00-per-share annual dividend yielding 2% based on the closing price of NACCO Industries' stock on May 7. NC Dividend data by YCharts. Chart reflects impact of Hyster-Yale spinoff in September 2012. Is The Inventory Story at Nacco Industries Making You Look Clever?